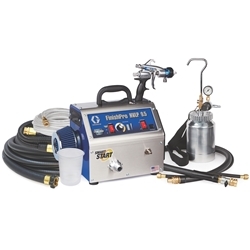 Graco HVLP sprayers are now available in several different models - Standard, ProContractor and ProComp. Engineered for superior atomization in the widest range of materials. Graco HVLPs are the coolest running, longest life HVLP sprayers on the market today. Spray small to medium jobs. HVLP is built for extreme control jobs.